The boat is 51 feet, 4 inches in length, with a beam of 14 feet, 8 inches that helps create a spacious cockpit for sportfishing or relaxing in the open air. The swim platform has a concealed swim ladder, and a transom compartment houses the boat's Glendinning Cablemaster shore power cord system. There is plentiful seating in the lower area of the cockpit, with an electrically operated aft bench settee along the transom and an aft-facing curved bench seat backing the helm ? separated by a movable table. The cockpit is equipped with a wet bar, a DC breaker panel on the port side and storage compartments. You can reach the engine room through a hatch in the cockpit deck ? and we enjoyed the additional headroom provided in this compartment, when compared to other boats of this size. The engine room is nicely gelcoated and insulated with a 2-inch vinyl barrier. The main components in this space are an auxiliary generator and twin 450 hp Cummins 480 CE diesel V-drives, with underwater exhaust to help reduce noise under way. I noticed that the engines, hoses, Y-valves and seacocks are easily accessible, without having to become a contortionist. The helm station, located under the hardtop, offers a nice dash layout with a digital engine display, gauges and electronics. The switch panel is located on the right side of the console. A Euro-style adjustable skipper's seat is located on the starboard side, with additional guest seating centered at the helm, leaving the port side open for cabin access. Extended cruising not only requires a boat that was built for the long haul, but a boat that was built to make the trip completely enjoyable. 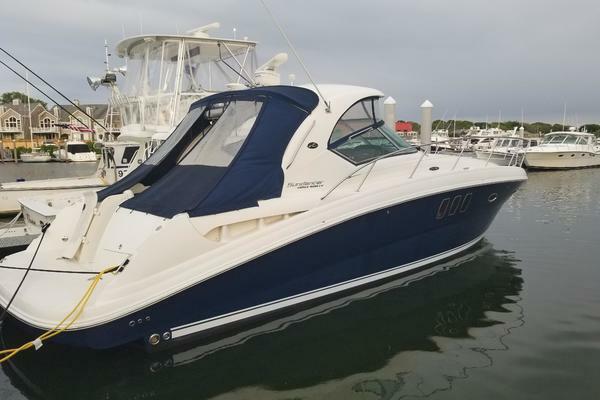 That's why Sea Ray created the 460 Sundancer. The cockpit of the 460 Sundancer creates a relaxing atmosphere with a custom slide and swivel helm seat with a flip-up thigh-rise for the captain, and a Euro-style companion bench seat. 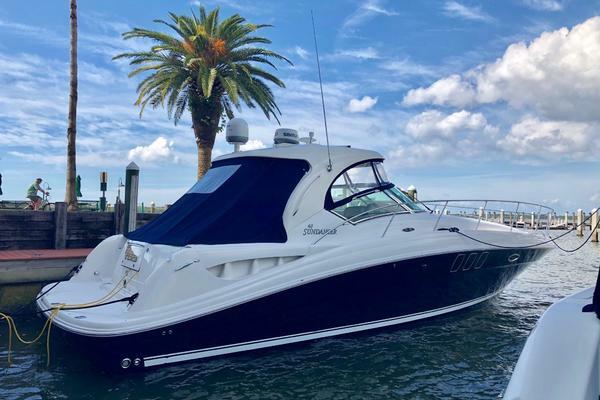 The ergonomically designed control station not only puts the latest Raytheon electronics and Sea Ray's backlit instrumentation close at hand, it also reflects Sea Ray's dedication to style with a tan dash gelcoat and high-gloss burl wood panels. There's even a digital LCD systems monitor for engine diagnostics and pump monitoring. Passengers have plenty of room to enjoy the sun with spacious U-shaped cockpit seating (with an electrically actuated retractable sunpad), and a movable cockpit table. Carefully planned details like a snap-in carpet liner, self-bailing fiberglass cockpit liner, a wetbar in the side panel to port, and a Clarion AM-FM digital cassette stereo with six-disc CD changer, subwoofer, four speakers, and a cockpit remote control make the 460 Sundancer ideal for quality entertaining. The oversized swim platform is easily accessed through a transom door. When it comes to storage, the 460 Sundancer has all the space needed for long excursions, including aft wall fender storage which keeps docking equipment neatly tucked away. Additional gear can also be stowed in the seats and side storage areas in the cockpit. The cabin of the Sea Ray 460 Sundancer has a comfortable salon with an electric sleeper sofa, movable dining table, and an entertainment center featuring a TV - VCR - radio combination, and Clarion AM-FM digital cassette and single CD stereo system with six-disc CD changer, amplifier, and four speakers. A washer and dryer combination has been included in the mid stateroom for at-home convenience. Complementing the decor of the room are granite-look countertops, handcrafted wood trim, and lush marine-grade carpeting. The galley comes complete with everything necessary for long trips, including a recessed three-burner cooktop, refrigerator and freezer, microwave oven, even a Spacemaker coffee maker. 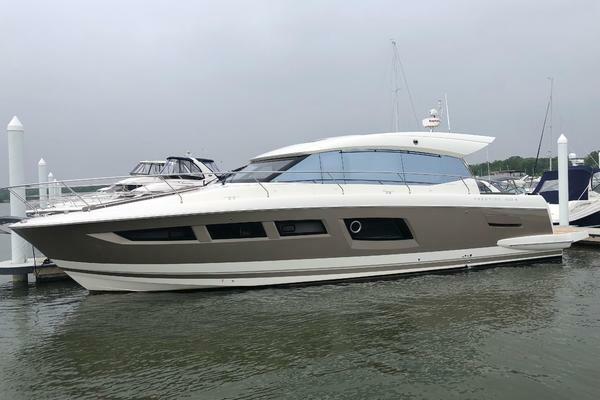 Owners and their guests can retreat to their own private quarters on the Sea Ray 460 Sundancer, including a forward stateroom with a full-size bed, cedar-lined hanging lockers, vanity, and sliding privacy door with full-length mirror. In the mid stateroom, a comfortable sofa converts to a double bed by simply flipping a switch. There are two private head areas featuring a VacuFlush head with shower, plus both staterooms have their own entertainment centers with TV - VCR - radio combinations. The 460 Sundancer is powered by twin 450 horsepower Cummins V-drives with a patented underwater exhaust system. The 460 Sundancer has durable underwater gear including a unique bonding system, manganese-bronze rudders and struts, seacocks on all fittings, and dripless shaft logs with an extra seal carrier kit. The galley is located on the port side and offers a notable amount of cabinet space and drawer storage. The galley's countertop looks especially large, thanks to molded covers that conceal the sink and stovetop. The 460 comes equipped with a coffeemaker, a microwave/convection oven, a three-burner cooktop and an upright refrigerator/freezer. The main saloon has comfortable Ultraleather seating, with both an inclining chair and a sofa that turns into a slide-out berth with the flip of a switch. There is cabinet storage above the seating along the starboard headliner. In the center of the saloon is a movable oval-shaped high-low table that has two kidney-shaped padded stools. Each stool tucks in out of the way under each end of the table, when not in use. One head is located on the saloon's port side with access from the saloon or forward stateroom and the other head is located in the aft stateroom. The forward head has an enclosed shower with the aft head utilizing a pullout faucet sprayer, and both have VacuFlush toilets. There are two staterooms, as mentioned, and both have solid sliding pocket doors for privacy. The forward stateroom has a flat-screen television that you can watch from your full-size berth. The berth offers storage underneath, where a subwoofer for the surround-sound stereo system is installed. A vanity with a stool is located to starboard, and the stateroom is completed with two hanging lockers (to port and starboard). The aft stateroom serves a dual purpose. It is a conversation area open to the main saloon during the day, then converts into an enclosed stateroom at night. You slide the dual sliding doors closed, then transform the area's wide settee into a full-size berth. The stateroom also has a cedar-lined hanging locker and a built in television.